Today’s computer hardware was designed to run a single operating system and a single application, leaving most machines vastly underutilized. 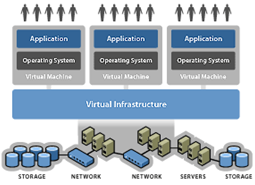 Virtualization lets you run multiple virtual machines on a single physical machine, with each virtual machine sharing the resources of that one physical computer. Virtualization works by inserting a thin layer of software on a computer or a host operating system. This software contains a monitor that allocates hardware resources dynamically and transparently. Multiple operating systems run concurrently on a physical computer and share hardware resources with each other. You can safely run several operating systems and applications at the same time on a single computer, with each having access to the resources it needs when it needs them. Virtualization technologies, such as VMware, can even spread these virtual machines across large pools of servers and storage, called Virtual Infrastructure. This increases availability of virtual servers by reducing the importance of individual physical servers. Reduce data center costs by reducing your physical infrastructure and improving your server to admin ratio: Fewer servers and related IT hardware means reduced real estate and reduced power and cooling requirements. Better management tools let you improve your server to admin ratio so personnel requirements are reduced as well. Increase availability of hardware and applications for improved business continuity: Securely back up and migrate entire virtual environments with no interruption in service. Eliminate planned downtime and recover immediately from unplanned issues. Gain operational flexibility: Respond to market changes with dynamic resource management, faster server provisioning, and improved desktop and application deployment. While the benefits of virtualization are clear, getting there is not. Virtualization takes capital, experience, testing and time. And no matter how good of a job your IT staff does Virtualizing your infrastructure, it remains only as good as its weakest link, which in most businesses is its own location. Subject to power outages, weather events, fire, security breaches, and loss of connectivity, on-site data centers are listed as the number one concern of 70 percent of CIOs. Fortunately, Evolve IP offers businesses with the opportunity to virtualize their servers, Desktops and Applications to Evolve IP’s Private Cloud.